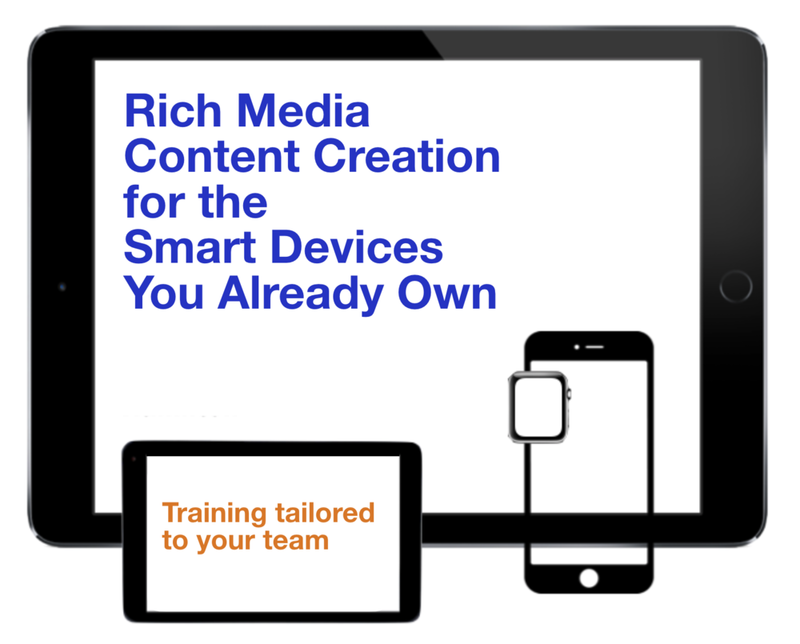 A lot of organizations think they need to hire expensive videographers or buy costly video and audio equipment to have rich media content on hand. But your team members probably already have smartphones and tablets capable of shooting great video and capturing excellent sound. All they need is some training in how to get the best quality from those devices. And, they may need some help understanding how best to tell stories with those devices, which software to use, and which workflows work best to create that content effectively and efficiently. I've been producing near-real-time smartphone videos for clients for years. I've developed techniques, workflows, hardware and software tools that make that possible. In a one-day workshop I can pass on the basics to your team. That way they can make and share videos that take a couple of hours to produce instead of days. And, they can do it in house, with the gear they already have. That saves you thousands of dollars and gives you the capacity to create rich media to feed your online presence more frequently. Example of video interview done completely on a smartphone. For Harrowsmith Magazine.